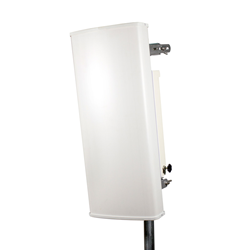 KP Performance Antennas, a manufacturer of WISP antennas and accessories, announced today that it has introduced a new 34-inch-tall MIMO sector antenna operating in the popular 5 GHz band that features 8 inputs and HV-polarization. KP’s new KP-5HVX8-65 sector antenna features dual-horizontal/vertical-polarization with a 65° azimuth beamwidth and eight ports, all within a single 34-inch radome. It delivers high gain over a wide bandwidth of 4.9 GHz to 6.4 GHz with up to 17.5 dBi gain at 5.9 GHz. The antenna is supplied with a robust, universal adjustable bracket with wide U-bolts for mounting on poles or tower legs up to 3.5-inches in diameter. This new sector antenna from KP Performance has eight 5 GHz ports with collocated patterns all facing in the same direction. Connecting two four-port radios provides additional redundancy and can be leveraged to increase capacity by using separate channels on each radio. Pairing the sector with two of Mimosa’s A5C radios (4 ports each) provides an additional +2 dBi beamforming gain, which allows for extremely long shots with Mimosa’s high client speeds. Four of these antennas mounted to a tower provides complete 360° coverage which can be increased to six antennas for more dense applications. These new 8x8 sector antennas are in-stock and can be ordered directly from the KP Performance Antennas website at https://www.kpperformance.com. For inquiries, please call 1-855-276-5772.